A typical presentation silver screen is placed on tripod in front of a video projector. In between the projector and the screen there is a pedestal-table with a high voltage switch button. On the screen there is an image of the artist completely motionless, in deep sleep. If the viewer pushes the button a powerful high voltage lightning hits the artist, his head and body are heavily shaken and a strong hissing noise is heard. He soon recovers, brings forward a book and starts reading from it. It is original Latin text of "Plinii Naturalis Historia". If not disturbed by the viewer the artist will read for some time and then fall again into the motionless state of unconsciousness. Powerful lightning will shake him whenever the viewer presses the button. 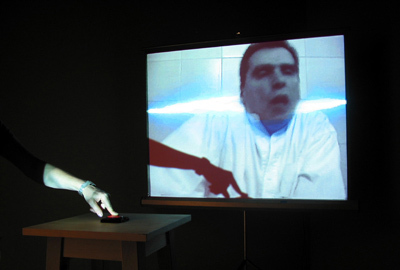 The table with the button is positioned so that the hand of a person pressing the button is seen on the screen as a shadow over the body of the artist.